I love when my Instagram dinners turn into blog recipes. Today’s recipe is exactly that – a lazy dish I made that received a lot of, “are you going to share the recipe? !” comments. Thus, I decided to bring it to the blog! For some reason, I feel like the Instagram picture looks better than these styled photos. Either my DSLR photography is lacking or my Instagram skills are on fleek. I’m going to go for the latter. My mother used to make breaded lemon sole all the time when we were growing up – and I loved it! It was so lemony and crunchy and delicious. Now, I’ve made this dish healthier, using almond meal as the breading instead of breadcrumbs or panko. It’s just as flavorful, and of course, much better for you! I’ve had a hard time finding chayote in the grocery stores lately, so when I saw it was being sold on Fresh Direct, I had to order it, of course. 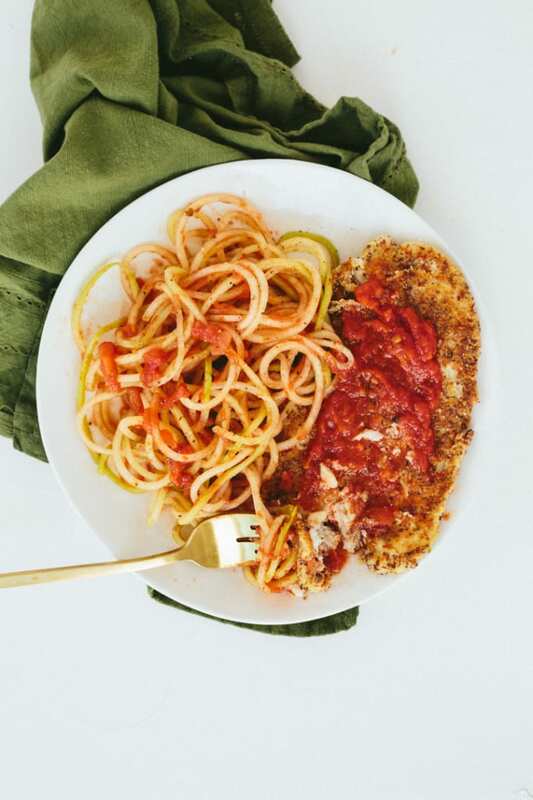 I love chayote – it’s like the Mexican version of zucchini and it’s crunchier, lighter and releases less moisture when cooked, so it works well with warm sauces like this tomato basil. The skin of chayote is thick (thicker than a cucumber’s skin), so many people peel chayote first before using it. I don’t mind the skin and I think it gives it a lovely crunchiness. Again, total preference – do what works best for you! This nutritional value was calculated taking into consideration that the entire egg is not used- it’s only for dredging. Place two shallow dishes side by side. In one, crack in the egg and whisk. In the other, add in the almond meal, season with salt, pepper and garlic powder and mix thoroughly. Spread the almond meal in an even layer in the baking dish. Dip one sole filet in the egg and coat. Then, dip in the almond meal mixture, flipping over to coat all sides. Set aside on a plate. Place the olive oil in the medium skillet and let heat. Once heated, add in the fish and cook for 3 minutes, flip over and cook another 2-3 minutes or until the fish easily flakes with a fork and is opaque white and breading is golden brown. Once you flip over, squeeze the lemon over the fish. Meanwhile, in the large skillet, add in the chayote noodles and cook for 3-5 minutes or until al dente. 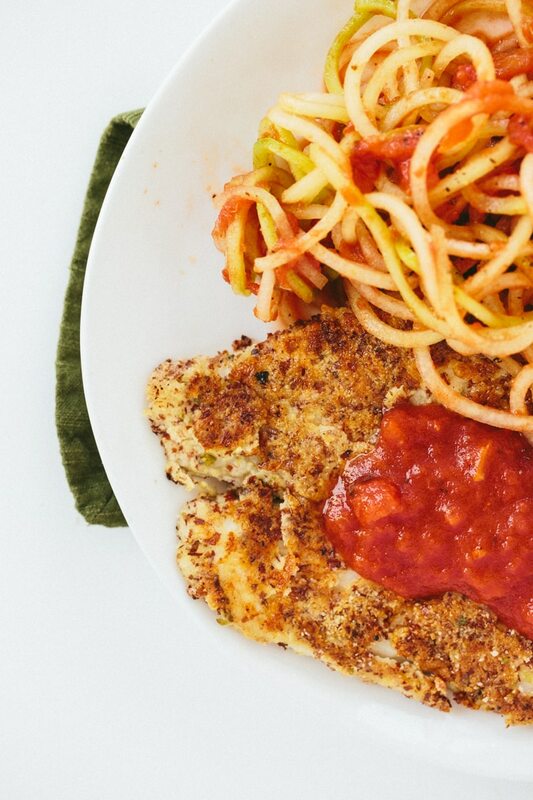 Once almost cooked, add in the tomato basil sauce and toss together, cooking another minute for the chayote to finish cooking and the sauce to heat. 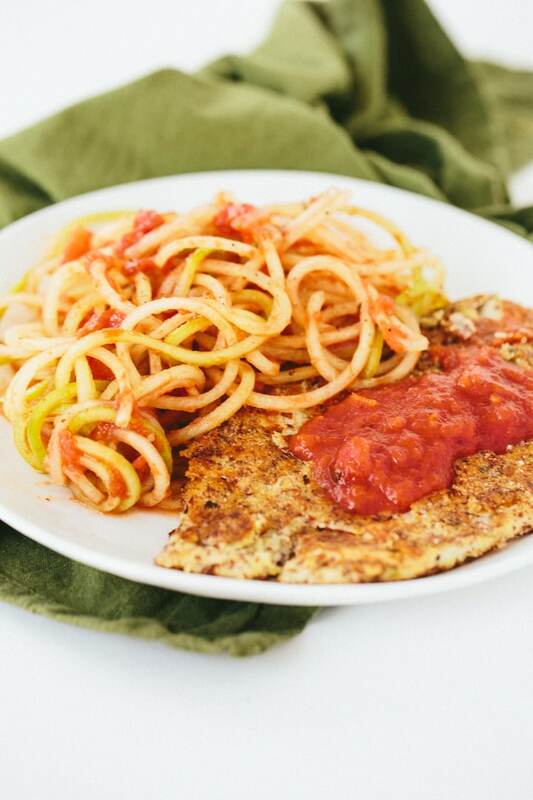 Serve the chayote noodles with the lemon sole. 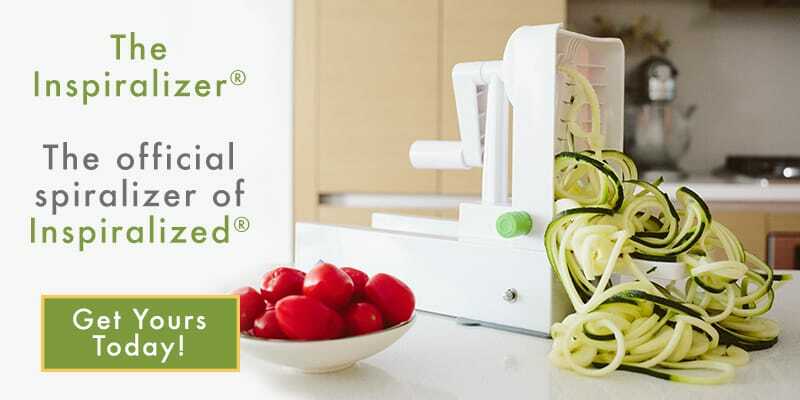 Do you recommend the spiralizer with the four blades over the original which has three? I have never eaten chayote before, but I bought one at the market last week figuring that you would have an Inspiralized recipe for me to try. I was not disappointed! 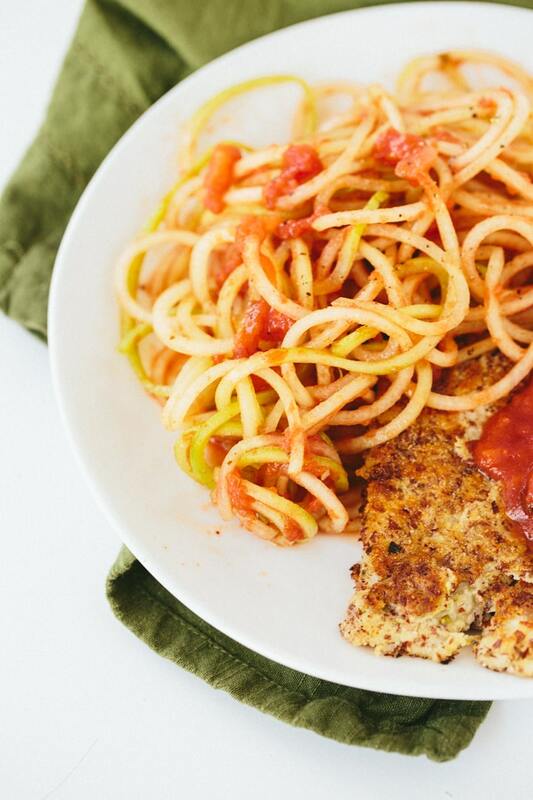 This is one of those rare quick & easy recipes that makes you look like a gourmet cook. Wow, it is that good! I left the skin on the chayote like you recommended and it made perfect noodles: light tasting, with a pleasant bite. Thank you. Ps. Actually all Inspiralized recipes make anyone look like a gourmet cook. We LOVE hear this, Michele! We're so happy you were inspired to explore a new veggie and that you loved it! Keep it up! 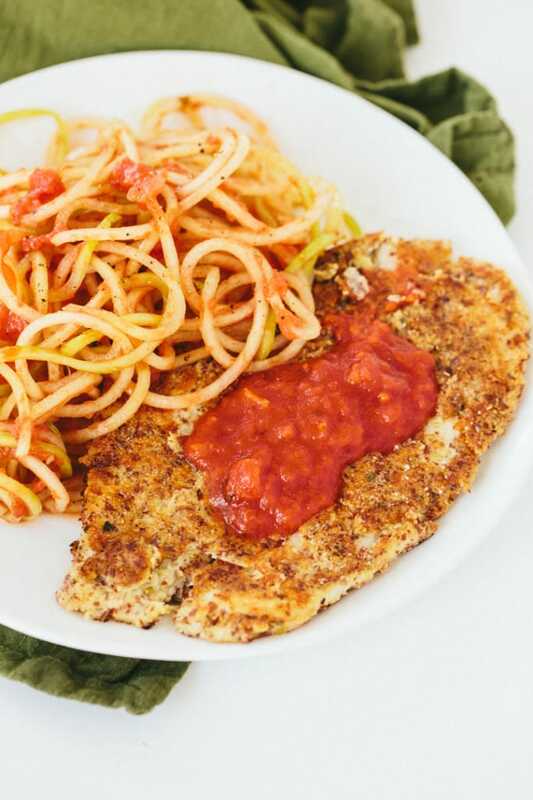 Hi there,I check your blogs named "Gluten-Free Breaded Lemon Sole with Tomato Basil Chayote Pasta — Inspiralized" on a regular basis.Your story-telling style is witty, keep it up! And you can look our website about free anonymous proxies.